Ongoing: Fragments of humanity. Archaeology in Québec is the first major exhibition entirely dedicated to Québec’s archaeology, and it celebrates 50 years of archaeological discoveries in Québec. Two hundred important pieces are included. Chosen from among work in collections and artefacts found in archaeological digs on more than 10,000 sites throughout Québec, these objects reflect and recount Québec’s past and uncover a remarkably diverse territory. 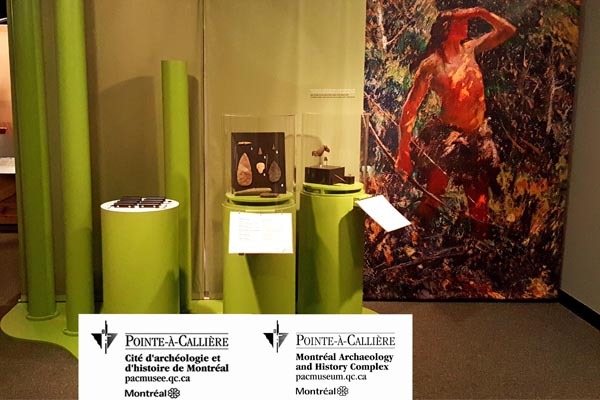 The exhibition includes several items from the archaeological holdings of the Department of Culture and Communications of Québec (MCCQ) displayed for the very first time. Created by Pointe-à-Callière, an archaeological and historical museum in Montreal, the exhibition also features objects on loan from nearly a dozen other sources, such as the City of Montréal, the City of Québec, Pointe-du-Buisson Québec Museum of Archaeology, Avataq Cultural Institute, and Parks Canada. The exhibition brings to life the events and ways of life behind these fragments of humanity. Each piece, in its own way, reveals a different aspect of Québec’s heritage. Arranged both chronologically and thematically to highlight the rich and varied archaeological collections of Québec, the exhibition is divided into four parts: ancient stories, a land of trade and commerce, chronicles of everyday life, and stories from the depths. ‘Fragments of humanity. Archaeology in Québec’ was organized by Pointe-à-Callière in collaboration with the Department of Culture and Communications of Québec. A financial contribution for this exhibition has been given by the Government of Canada.